If ever there were anyone in a position to know the difference between what is money and what is not, Morgan certainly knew. Credit is debt. Debt can never be money. Federal Reserve Notes, those that you have in your wallet and circulate in transactions are pure debt issued by the Federal Reserve. As we have stated several times, they are not Federal, there are no reserves, and they are not Notes. A note is a promise to pay something to someone within a specified period of time. There is no such promos on any Federal Reserve Note. These are undeniable facts yet many deny acknowledging this reality. Those with legitimate money, gold and silver, will stand the best chance of financial survival as the globalist’s continue to destroy the world in order to construct their New World Order dominance over everyone and everything. Will they succeed? So far, they have in an unconstrained manner. How well will those with gold and silver fare once the current fiat “dollar” scheme blows up in their faces and claim they never saw it coming? That remains to be seen. They will have means, but most of those who survive without any financial means will view those who have gold and silver with contempt. We do not know for how much longer one will be able to acquire gold and silver without being subject to total government scrutiny, but for that reason alone, one should be in a continual purchase mode for as much as one can. 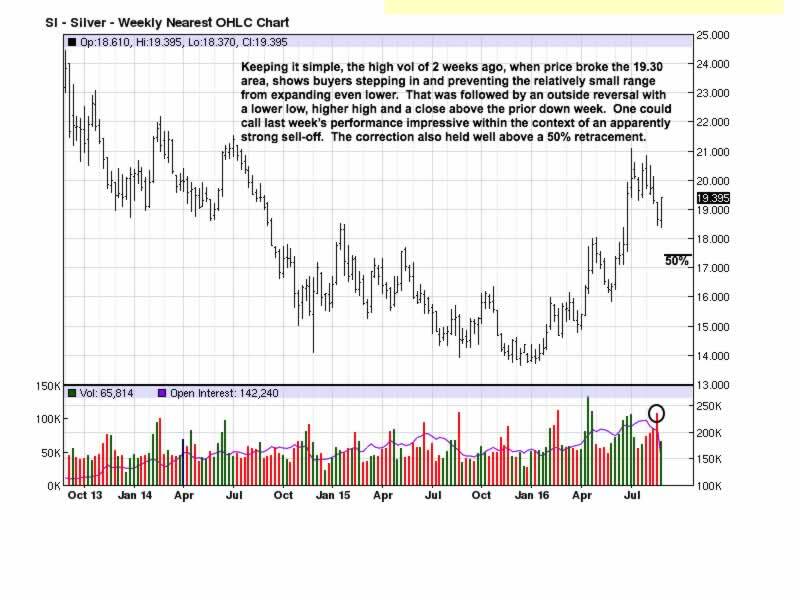 It appears that gold and silver prices will continue to be kept low. The anticipated upside explosion did not happen in 2013, 2014, 2015, and most likely not in 2016. As to 2017? It is too soon to tell. Just keep acquiring PMs without letting anyone know you are doing so. Always remember, if you do not personally own and hold it, you do not have it. Expectations for the demise of the fiat “dollar” have been misplaced, at least with respect to time, and as everyone knows, timing is everything. Since the breakout rally in 2014 out of a protracted TR, the correction has been mostly sideways. Weak corrections almost always lead to higher prices, and the probability of higher levels is greater than not. That would not be good news for gold and silver. 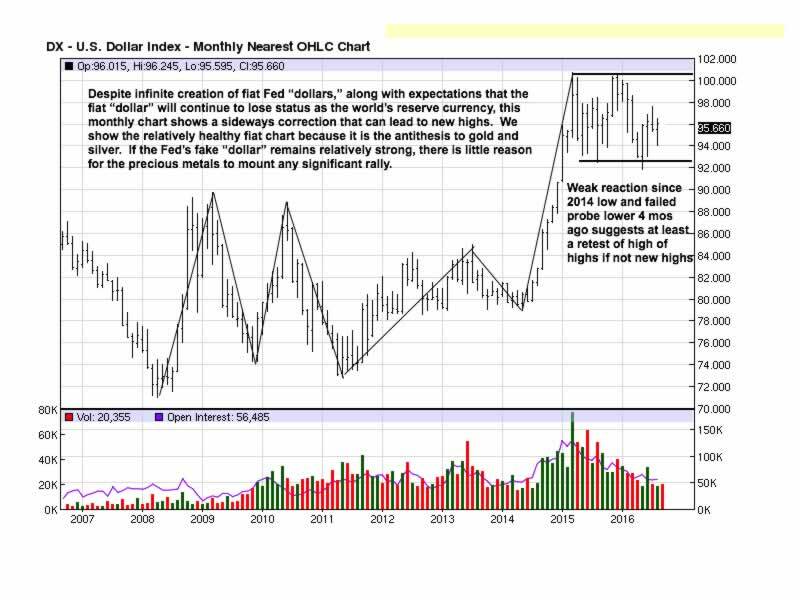 Any notions that a new currency, including the SDR, will have gold backing is folly. China just issued the first Yuan-denominated SDR, more evidence how the rest of the world is fast-moving away from the dollar as the necessary reserve currency for trade. No more. China’s currency, [not money, but currency] is all digital, which is imaginary, not real. The interest in having the Yuan included in the SDR basket of currencies, starting in a few months, is China’s acceptance of another paper currency replacement, the SDR, over the US “dollar.” The SDR is controlled by the IMF, the globalist’s organization, and using gold backing by the globalists for anything will never happen. The second rally after the second failed probe lower was not as strong as the rally after the first failed probe lower in 2015. Price is within a TR, so there is little information to gain a solid insight as to which direction price will break. Recent activity from the daily is more constructive than what shows on the weekly chart just discussed. The gap rally in July was a higher low that led to a higher high. 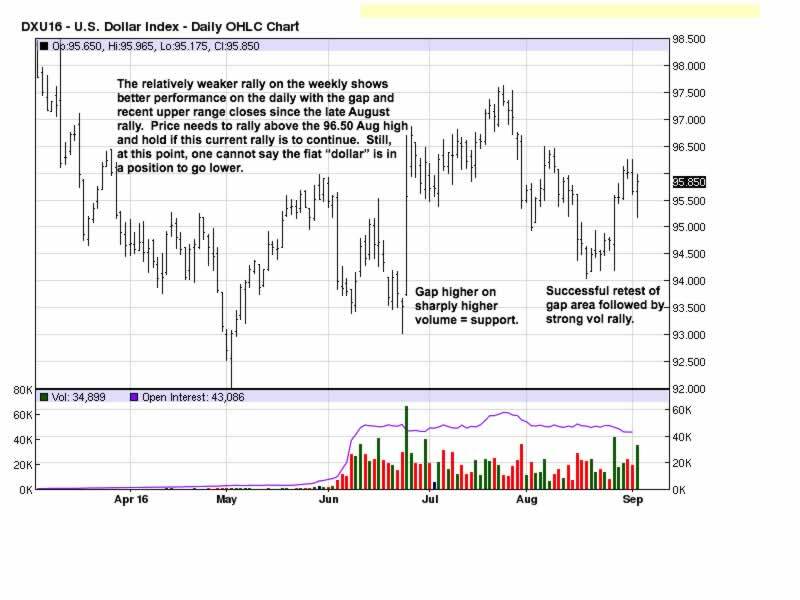 Overall, price is in a TR on the daily, but the higher volume bars are to the upside with closes near the highs, and this typifies buyers being in greater control. Odds favor higher prices, and odds favor the central bankers defending the fiat “dollar” from losing its status as a reserve currency, even though that fate is sealed and is just a matter of time. These opposing forces are why PMs prices are not likely to rally with impunity any time soon. There have been many who report on gold and silver saying charts are incredibly constructive, higher prices are coming soon, etc, etc, etc. We do not see it. The highest volume ever occurred in July, yet the bar range was very small. 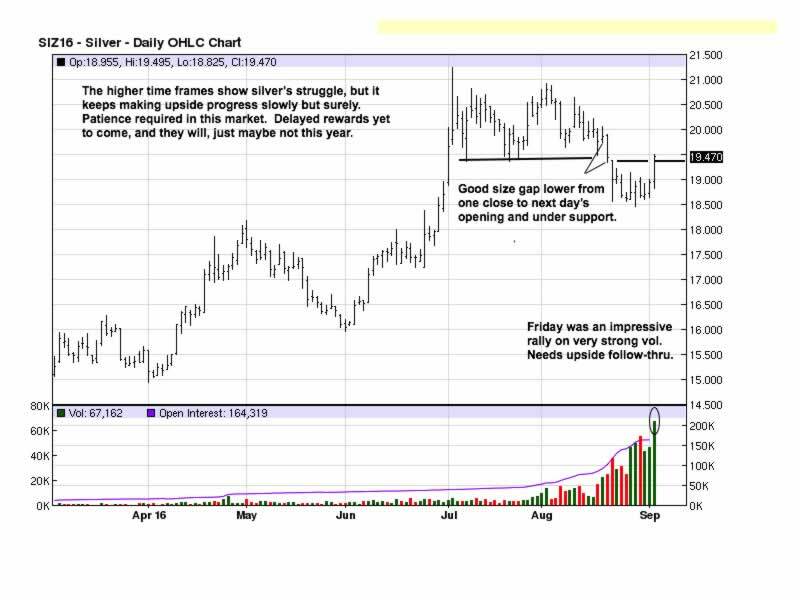 This tells us that sellers were overwhelming buyer’s effort to move gold higher. Buyers failed. The volume effort was not even enough to retest 1,400. 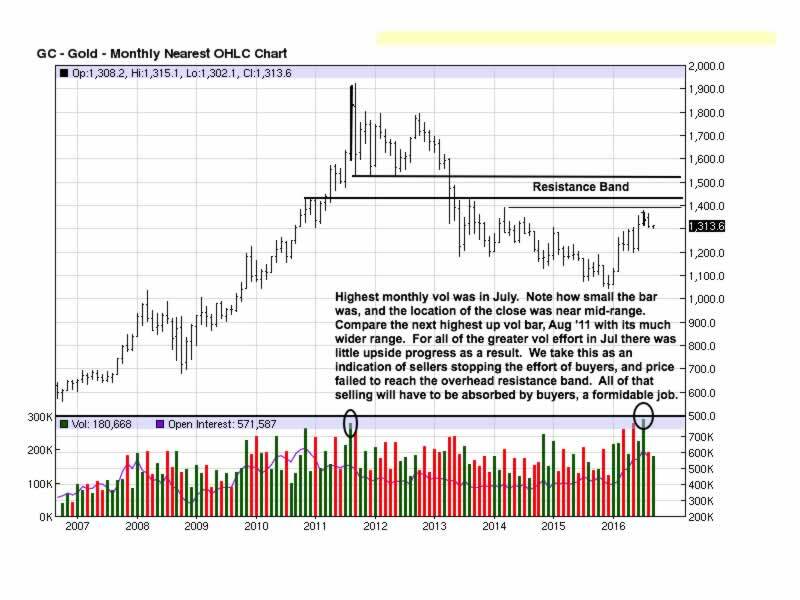 If the volume and interpretation are on point, then July should act as a cap on gold prices for many months to come until buyers are able to overcome sellers. Even if price were to rally above 1,400, there is still a wide band of resistance to impede rallies. 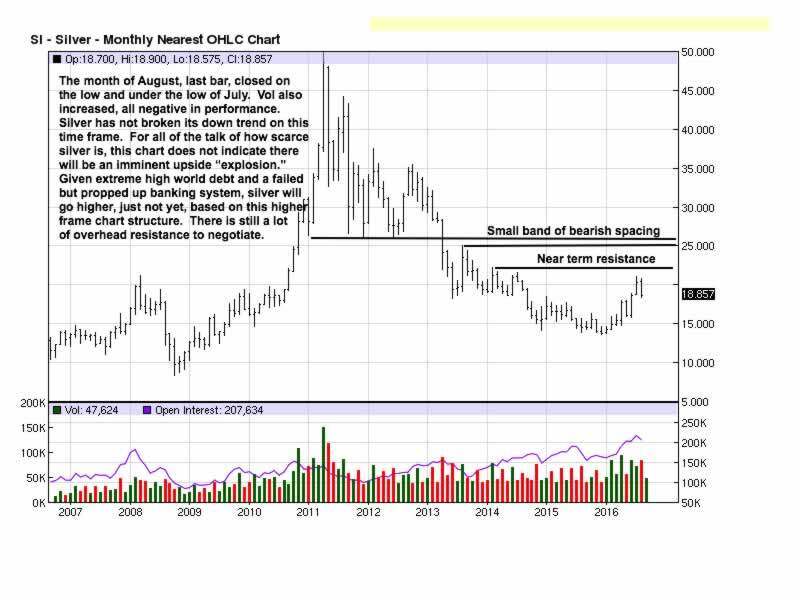 For as much as we favor and expect eventual higher prices for gold, the charts do not indicate it will be any time soon. All of this can change at any time should some crises occur to propel gold higher, but that would be a future event that has not yet happened, and any analysis can only take into account that which is, with no concern for that which cannot be known in advance, at least in terms of timing. over the span of the entire chart, the activity is a broad TR event. 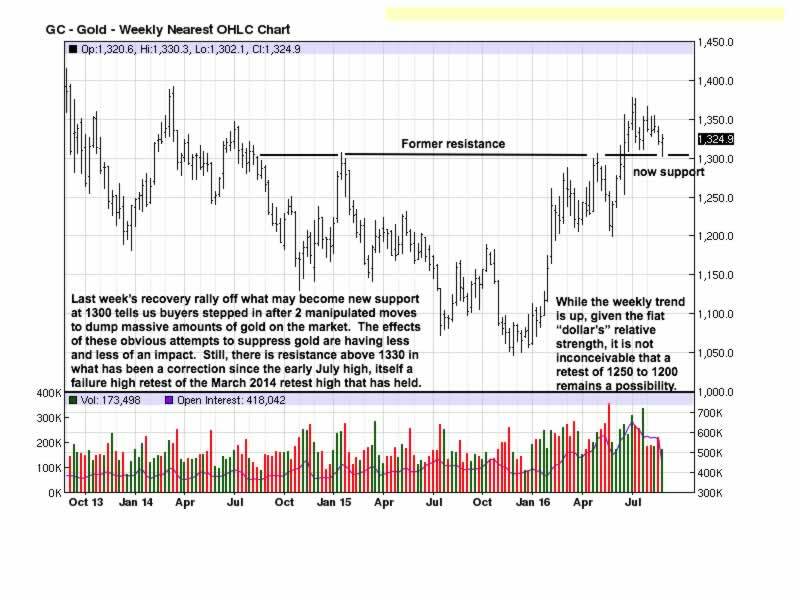 1,300+ is support, as of last week, but it would not take much to breach that level and move lower to retest 1200. 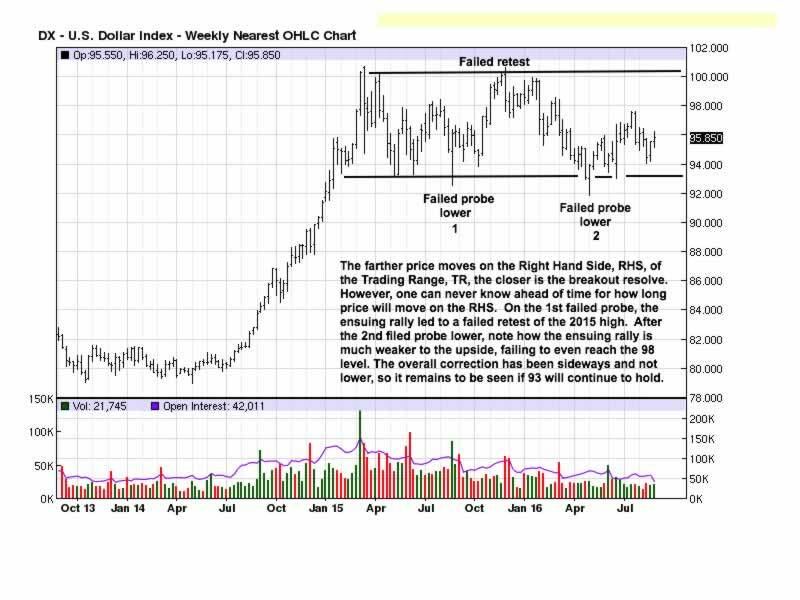 The next few weeks should provide more clarity as to what may unfold near term. We pointed out the larger volume effort has been on up days, but price is nearer the TR lows since the strong June rally. For all of the effort spent, there has been no upside payoff over the past three months, and our note of caution stems from what the market is indicating, not what people are saying. The market is always the final arbiter. may well hold, but that does not mean price can move in a much longer TR over the next several months to even another year. Should something happen to catapult price higher sooner, great, but the charts are not showing a dynamic move is coming any time soon. 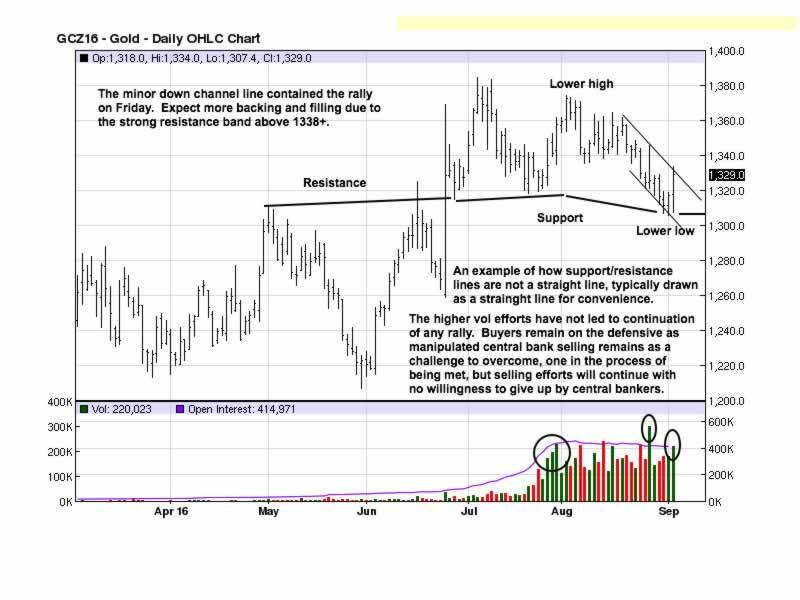 The near term trend is up since the December 2015 low, and last week’s outside reversal could act as support, but there is still a few months of overhead activity that will act as a buffer for the immediate few weeks ahead. Price held well above a 50% retracement on the weekly, but is failing to reach a 50% retracement rally on the daily. There is no synergy between the various time frames, and that accounts for the more cautionary read for what price may do in the remaining months for 2016. All of the above analysis pertains to the paper market, one that is heavily manipulated. The physical prices reflect the paper market, but wholesale recommendation to keep buying physical gold and silver is without any concern for what the paper market is misconveying. We always recommend buying to have, but the sense of urgency for being fully invested has room to be more select over the next few months. We could be wrong, and one should remain true to their buying physical strategy for reasons other than price. The most prevalent reason would be political, coming from governmental interference of some kind. That is always a wild card.